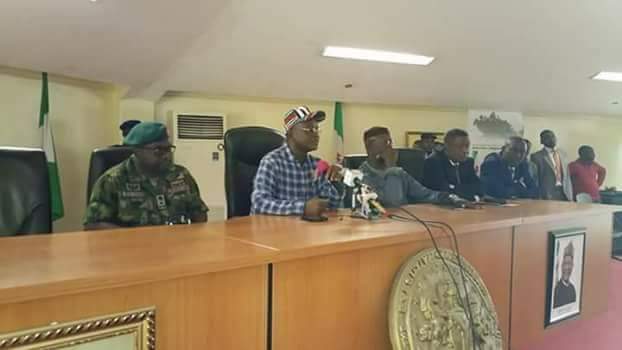 Governor Samuel Ortom has urged the people of the state to remain calm in the face of what he described as obvious provocation by Fulani herdsmen even as he called for the arrest of some of their leaders. He made the appeals while addressing journalists at the old Banquet Hall of the Benue Peoples House, today, on the protest by youths who blocked some major roads in Makurdi, the state capital as a reaction to killings by herders in the State. The Governor called for the arrest of the leaders of Miyetti Allah Kautal Hore who threatened to invade the state last year as those responsible for the current killings in the state. But he explained that actions carried out in anger against the killings were bound to complicate the situation adding that the people must avoid taking the law into their own hands as two wrongs cannot make a right. Governor Ortom said he appreciated the pains which the people of the state were passing through especially families of the victims, saying that he has informed the President about the development and was awaiting a positive reaponse. He stated that he and members of the State Security Council visited some flashpoints in Guma and Logo Local Government Areas yesterday and thereafter directed the deployment of security operatives to the places. The Governor reiterated that there was no going back on the implementation of the anti-open grazing law which he said was the permanent solution to the herders, farmers incessant clashes with attendant destruction of lives and property. He called on the Federal Government to rise up to its responsibility to protect the lives and property of Benue indigenes in order to give them a sense of belonging. The Governor insisted that the leadership of Miyetti Allah Kautal Hore must be arrested for making inciting statements concerning the open grazing prohibition and ranches establishment law and for carrying out their threats. Governor Ortom also received 23 indigenes of the state who graduated as cardet inspectors from the Nigeria Police College, Ikeja, Lagos. He commended them for exhibiting high sense of discipline to achieve such a feat, and urged them to strive to add value to the Force and aim to get to the topmost position.